A reconstructed colonial fort, Fort Stanwix is located in Rome, NY. Fort Stanwix offers a detailed look into the history of the United States, alongside unique programming and demonstrations. Built by the British between 1758 and 1762, Fort Stanwix was a key defensive point during the French and Indian War. By 1776, American troops had rebuilt it to be used in the American Revolutionary War. Fort Stanwix played a key role in these and other moments of United States history before being closed in 1781. Years later, the original fort had been reduced to ruins, but the land occupied by the fort was designated as a national monument in 1935. When interest in the fort began to grow, archeologists began searching for the remains. What remained of Fort Stanwix was uncovered in 1965; by 1974, a reconstructed fort had been built; it was opened to the public in 1976. Fort Stanwix has several permanent exhibits available at the park each day. Marinus Willett Collections Management and Education Center – The Willett Center acts as Fort Stanwix’s Visitor Center. Aside from offering informational services and restrooms, the Wilmett Center features a small museum. Exhibits in the museum describe the fort’s military history and present historic objects found in the ruins of the original fort. The Visitor Center is also where guests will partake in an orientation from a park ranger. 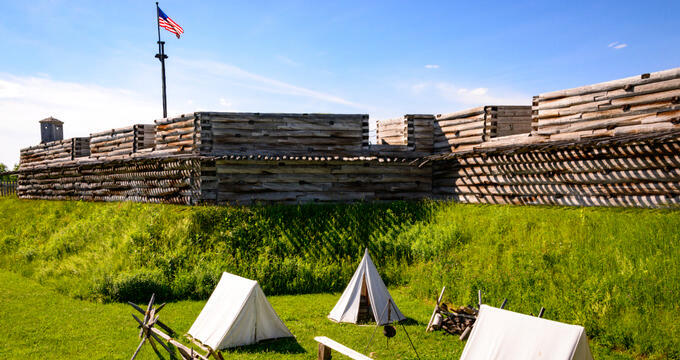 Fort – Recreated based on the ruins of the original Fort Stanwix, the fort is the park’s most beloved attraction. Visitors can tour the grounds on their own or with the help of a park ranger. Reenactments in the fort are also frequent. Around the fort are three trails; each mirrors the events of various historical events, which can be explained in greater detail by a park ranger. If wishing to tour the grounds in a group, visitors should contact Fort Stanwix’s Program Coordinator. More specific information about guided tours can also be found on the fort’s website. Fort Stanwix is committed to providing quality education to the students who visit the park. Field Trips - The monument is happy to accommodate field trips. They offer programs that are targeted to a variety of grade-levels; each is aligned with the New York State Learning Standards, as well as Common Core Standards. For older students, it is recommended that educators collaborate with Fort Stanwix’s Education Coordinator to prepare a program that will best benefit their students. The monument also welcomes home school groups. Educators are encouraged to make reservations online in advance. Teachers will need to fill out a request form to coordinate their visit. Junior Explorer Program - Fort Stanwix also participates in the Bureau of Land Management’s Junior Explorer program. This program educates young people about National Parks across the United States. Educational materials and fun booklets guide children through the historical elements of Fort Stanwix. This program gives young visitors the tools they need to become respectful visitors of national monuments, while also encouraging them to have fun. Materials can be obtained online or at the Junior Ranger Station in Fort Stanwix. Backyard Rangers – Each month, children are invited to Fort Stanwix to learn about the monument in a collaborative, outdoor environment. Fort Stanwix consistently hosts a variety of special events for its visitors. Presentations about the fort’s artifacts, weapons demonstrations, family programming, and exercise programs are all among the fort’s offerings. Walk Through Time – This recurring event includes a tour of the monument. During the tour, a park ranger will share stories about the history of the fort and its grounds. Defending the Frontier – “Defending the Frontier” is a program that explores Fort Stanwix’s military history. The centerpiece of the program is a demonstration of historic weapons from the fort’s past. Family Fun at the Fort – Stationed in the Visitor Center, this event is great for visitors with children. Families are invited to play games, create art, and explore the park in a family-friendly environment. Tales from the Past: Artifacts of the Fort – During this event, visitors can see historical objects from Fort Stanwix up close, accompanied by vivid stories of how they were used. Fort Stanwix offers no dining options, but outside food is permitted on the park’s grounds. Guests are also directed to the town of Rome for a variety of dining options, often within walking distance. Guests can purchase educational materials, books, and souvenirs from the Eastern National Bookstore, located within the park.